It’s time for another Technostamper Monday Lunchtime Sketch Challenge! I haven’t used this Holiday Home stamp set much but when I saw the sketch for this week…well…I thought it would be perfect! All is Calm – striped print – 3/4 x 5 1/2. Add to bottom of dotted piece and wrap piece of Silver 1/8″ Taffeta Ribbon around it. 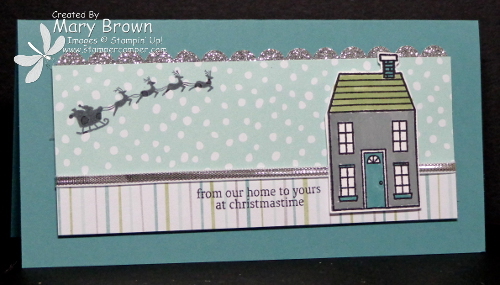 Stamp flying Santa using StazOn Jet Black on dotted and greeting on striped. Stamp house using StazOn jet Black on Whisper White. Color using Smoky Slate, Pear Pizzazz and Lost Lagoon Markers. 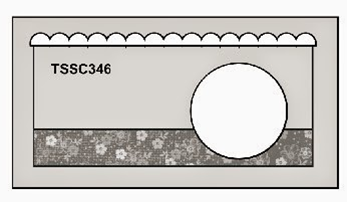 Cut out and add to card front using dimensionals. This entry was posted in Holiday Mini, Technostamper Challenge and tagged Holiday Home. Bookmark the permalink. This was a great set for this sketch! I love the little santa and sleigh stamped on the dp! Awesome card, I hope you had a wonderful Christmas! Thanks so much for all you fabulous samples for my sketches each week!